GOLDEN, Colo. (BRAIN) — Colorado-based Feedback Sports has acquired Scorpion Bike Stands LLC, which was based in Dana Point, California. The purchase includes patents and trademarks associated with the Scorpion bicycle stand developed by Scorpion founder Mike Diorio. CLEARFIELD, Utah (BRAIN) — Vista Outdoor Inc. has completed its purchase of the Bell, Giro, C-Preme and Blackburn brands for $400 million. 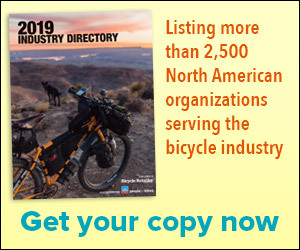 LEVIS, Quebec (BRAIN) — Hawley-Lambert North America has bought the inventory, including proprietary brands, once distributed by Seattle Bike Supply. SAN MATEO, Calif. (BRAIN) — GoPro Inc. announced agreements this week to acquire mobile video editing apps Replay and Splice. Merging Replay and Splice. CLEARFIELD, Utah (BRAIN) — Vista Outdoor Inc. has agreed to buy BRG Sports, Inc.'s Action Sports division, which includes Bell, Giro, C-Preme and Blackburn. DeLorme offers mapping products and GPS devices with satellite texting features. YARMOUTH, Maine (BRAIN) — Garmin Ltd. has agreed to buy DeLorme, a privately-held, Maine-based company that designs and markets consumer GPS tracking devices with two-way communication and navigational capabilities. LONDON (BRAIN) — U.K. e-commerce businesses Wiggle and Chain Reaction Cycle confirmed Friday that they will merge, pending regulatory approvals. The combined businesses will have annual revenues of more than 300 million pounds ($434 million). ROSSANO VENETO, Italy (BRAIN) — The Bigolin family, which owns the Selle Italia saddle brand, now also has an interest in the Selle San Marco brand, the companies announced this week. SAN DIEGO (BRAIN) — Less than a year and a half after being purchased by a San Diego composites manufacturer, Ellsworth Handcrafted Bicycles has been acquired by a local investor. NEVERS, France (BRAIN) — Look Cycle announced Wednesday that it had bought a controlling interest in another French cycling stalwart, the wheel maker Corima. PORTLAND, Ore. (BRAIN) — The Oregonian is reporting that The Clymb, a daily deal online retailer, was quietly sold to the owner of a similar business, LeftLane Sports, in September. SANTA FE SPRINGS, Calif. (BRAIN) — Bravo Sports Corp. has acquired protective gear company Pro-Tec from Dye Precision, Inc., adding it to its portfolio of action sports brands, which include SixSixOne and ONE Industries. The purchase price was undisclosed.